XP style Flat bitmap menu in dialog. 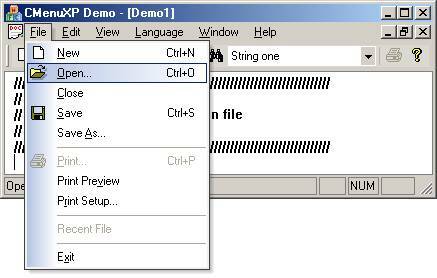 This article presents an implementation of an owner drawn menu with the Office XP and Visual Studio .NET visual style. It has icon menu and bitmap menu feature, it uses CMenu as base class. For MDI application, into the OnUpdateFrameMenu method of the child windows. For SDI application, into the LoadFrame method of the main frame. Without this call, menus will appear in a standard mode. To draw the menu items, I reused some classes already presented in my article: Office XP look & feel. 01/06/2003 - Adding flat borders and flat menubar. 05/31/2003 - Kris Wojtas has updated the source code to allow MenuXP to draw "radio", "check" state and gradient under bitmaps. 06/02/2003 - Corrections, radio items support (thanks to Kris Wojtas) and new demos (flat controls and dialog based sample). You can get the latest update to this article at www.azsoft.free.fr.